A cancer diagnosis sets off a domino effect like none other. In my case (if I don’t count my mother’s diagnosis), the first domino toppled on Easter 2010. My cancer domino effect was set in motion. Easter was when the chest pain started. Chest pain led to wait and see. Wait and see turned into wrong assumption of a “heart attack,” which in turn led to an ER visit. ER visit led to an EKG (all clear) followed by a CT-scan. Mass sighting followed by a mammogram marked as urgent, followed by an ultrasound. Next came initial meeting with surgeon number one to talk things over. Mass sighting deemed highly suspicious. Things were set in motion. So much to do. An ultrasound needle core biopsy was ordered. Disbelief and a feeling of disconnect. Initial meeting with oncologist took place the very next day. Genetic testing now required due to family history. Results came back – positive for BRCA2 deleterious mutation. Plans finalized for a bilateral mastectomy with immediate reconstruction. Dear Hubby and I established secret code for when I woke up to be our signal for clear lymph nodes. 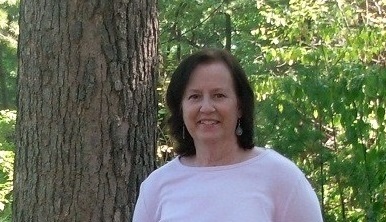 June 2, bilateral mastectomy day with immediate reconstruction. Lymph nodes not clear. I’m screwed. Considerable ranting and raving (by me of course). Expanders filled, how many times – who can remember? Reluctantly attended chemo education class to prepare. Feeling defiant and refused to shave my hair off. July – chemo began, as did side effects. Metallic taste, neuropathy, fatigue, flushing, insomnia, mouth sores. Started picking up the pieces of my life. Shaved off remaining hair strands. More body parts must go. WTF. Done. With the physical parts anyway. Good enough was/is just that, good enough. Moving forward to new normal. Stupid term. More worn, still adapting, perhaps (but probably not) wiser – certainly not better. Little white pills. Every day. That’s all we have anyway. Yes, cancer and the domino effect. How has cancer, or another life event, created a domino effect in your life? Here’s hoping that the next domino is just out of reach of the last falling one – for all of us. Julie, Yes, that would be nice wouldn’t it? Thanks for stopping by. Ahh… as the old saw would have it… “the ongoing saga”. Radiation leading to rib (and probably lung)damage. Mastectomy scarring adding to the mix that means I can’t inhale a good breath. So then there was the pneumonia last fall. More scarring on the lungs. The other side has a different reconstruction, an implant that was only put into the skin pocket. It does slow revolutions so sometimes the filler port is to the front, sometimes the back. It adds up to a constant reminder of the 12 year journey. Then there are the friends I have lost along the way to this disease, with another dying now. But three grandchildren later, there is always something bright and shiny in the future. Elaine, Oh my, that sounds like a lot of complications to deal with. And you’re right, there are also all the relationship changes along the way too. We need another set of dominoes for that don’t we? Thank you for sharing. Enjoy those grandchildren – “shiny and bright” for sure! One day at a time. So true. It’s a great post, how one thing leads to another and suddenly you’re pushed down an unexpected path, one thing after the other. I hope things are falling in place for you rather than pushing you down a path. Elaine, One thing really does lead to another doesn’t it? I hope things are falling into place for all of us. Stability is nice. Thank you so much for commenting, Elaine. ‘Chemo ended, received a certificate’? Please tell me you’re joking…that is the height of patronising. Beautiful poem. Casey, I think it’s pretty common to get a certificate at the end of chemo actually. It wasn’t something I cared to get, much less keep. Of course, the nurses were trying to do something special to “mark” the day, so I just took it home and, well, you know – tore it up! I wonder what others have done…might be an interesting question to pose. Thank you for commenting. The ‘no euphoria’ is such a BIG part of where I find myself now. Thank you for expressing this so well. Being Sarah, It’s interesting that those are the words that stood out for you. Thanks for sharing that. My best to you as well. Yes, the domino effect. And maybe it is growing older, but there seem to me more visits to the doctor, more issues…and before cancer, a cough was a cough, now it’s an x-ray to rule out lung cancer…. Elyn, Thanks for your supportive comments. 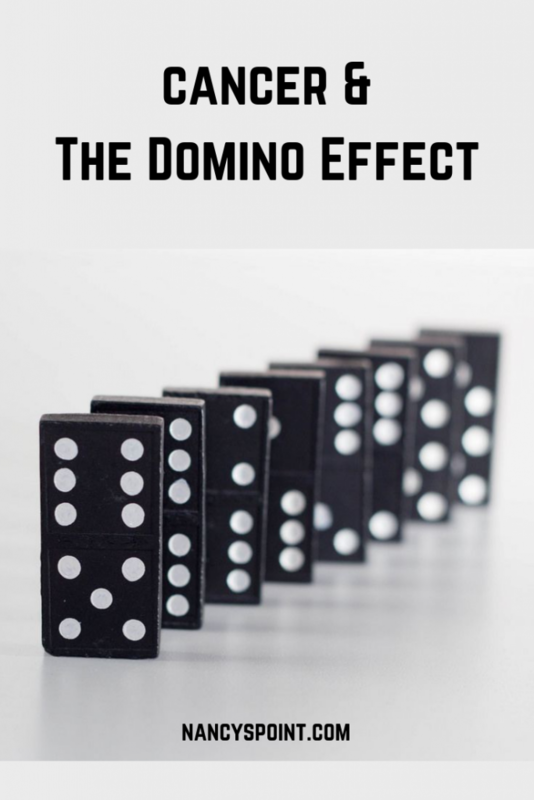 I know so many of us totally relate to the domino effect. Sad, but true. Kathi, Yes, I know what you mean! The domino’s keep on coming….makes me feel like a hypochondriac! English Lady, I’m sorry the dominoes keep on falling…you aren’t a hypochondriac, this is your reality. Thanks so much for reading and sharing. Hope to hear from you again soon! Nancy this was a perfect post! I love the stop/start word syncopation. And you describes the BC experience to a T.
Renn, Thank you for the your kind words. I’m happy and sad at the same time that you relate so well, Renn. You’ve forged a long path ahead of me. (I’m sorry that you have). Your recounting of the dominoes has consoled me a little (someone understands) and for this I’m grateful. Thank you. My latest dominoe to fall soon will be ‘more surgery’ because they didn’t get ‘enough’. Lynne, Thanks so much for stopping by and leaving a comment. I’m sorry you need more surgery because they didn’t get enough. So, your margins weren’t clear then? Good luck with the next “domino.” Let me know how things go. Maura, I really appreciate the fact that you care and want to understand what your friends faced and still are facing. I know you are dealing with so many things as well, so your empathy is appreciated even more. Life can be brutal, as you well know. Thank you so much for commenting, Maura. Wendy, Lots of nodding going on I guess. Thanks so much for stopping by. As a person with mets, I can relate. Just lather, rinse, repeat your post until death. Ann, Yes, I know you understand all too well and you’ve had a few more dominoes topple than I have. I appreciate your comment, Ann. I’m thinking of you. Hey Nancy! Stopping by to thank you for your comment on my blog. For someone who is “still figuring this blogging thing out” you’re doing a fantastic job! This post is beautiful. My mother battled breast cancer while I was in middle school, so this brings to mind a whole host of similarly painful memories… Thankfully her struggle is in the past and “normalcy” has been restored to our family after years of healing. Congratulations on your own recovery. I hope with all my heart you find the normalcy and peace this post alludes to. This prose-poem (at least that’s what it seems like to me) really says it all. This captures the hell you have been put through and the difficulty to adapt to a cancer diagnosis and its aftermath. I, too, have a domino effect, something I’ve been wanting to write about in a blog. For me it’s after cancer treatment, which has wreaked havoc on my bones, given me post-surgical pain, trouble finding bras and avoiding clothing malfunctions, as well as experiencing flashbacks. Beth, I know what you mean. There is so much aftermath too isn’t there? As so many others have alluded to, the dominoes just keep on tumbling. The hope is to at least slow the “momentum” down a bit. I’m sorry about the flashbacks and all the other fallout you’ve been experiencing as well. Write the post when you can. Thanks so much for sharing. The dominos just keeping falling even 3 1/2 years later. Malaise. Lethargy. Nutritional deficiencies added to the mix, supposedly as result of chemotherapy. New lump near mastectomy scar. Oncologist requests biopsy. Cousin diagnosed a year following me now has suspected Lymphoma. 4 friends with breast cancer mets. Chemo buddy passes away. When does it ever end? Koryn, I’m sorry to hear about all of your “falling dominoes.” I don’t know when or if it ever ends. I guess we just keep going day by day and hope for the best. What else can we do? Thanks for sharing your thoughts and good luck with everything you’re dealing with. I’m really sorry about your chemo buddy. That’s so sad. Hi Nancy, as so many of the comments here, I agree that you’ve perfectly captured this crappy experience. It’s interesting to me your use of short, descriptive sentences. Some of us bloggers tend to ramble since there’s always so much to say, but I like your choices here. You truly do sum it up. Hopefully, somewhere in that pile of dominoes, cancer falls to the bottom and stays there. Love to you. Stacey, Sometimes I can be less wordy! For this particular post that seemed to work. Thanks so much for commenting and for understanding every time. Love back at you! no CLUE how I missed this….. Personally, I think you should design a poster (enlist Kathi for the artwork?) using every line. This is beautiful…. and Yes, I actually DO know how I missed it…. my brain exited the building with Elvis quite some time ago. It’s all in there… I just can’t seem to get anything done! Ann Marie, Ha ha. Yes, a poster that’s a good one! I think you’re too hard on yourself and your brain is very much in tact! Thanks for your support and for giving me a chuckle. Like AnneMarie, I don’t know how I missed this, either, but several sister bloggers are linking to it, so I had to find it. Now I’m weeping. I love how you expressed the domino effect of a breast cancer diagnosis, yet hate the aftermath of cancer on lives. The latest domino to fall after my last cancer diagnosis in 2003 was a huge one: my marriage. Loss of libido, thinning hair, menopausal symptoms like hot flashes that wouldn’t go away, a flat chest that we both agreed should remain flat, and my swollen arm: maybe one or more contributed, but whatever the straw that broke the camel’s back, the domino fell with a crash that adversely affected, in more domino fashion, friends, sons, relatives and the church, to mention a few. 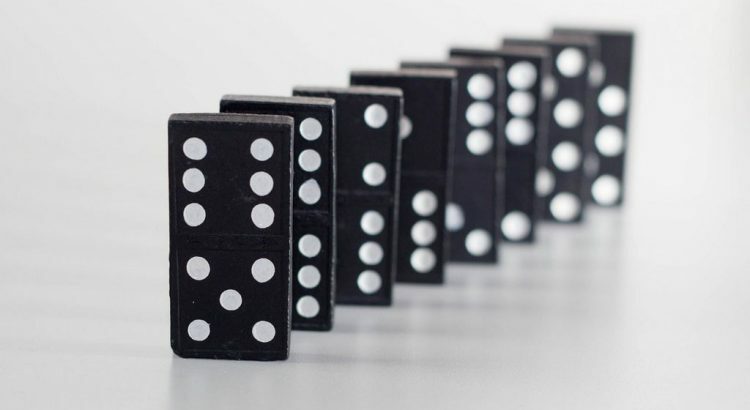 Jan, The toppling “marriage domino” must have been so devastating, Jan. As you said, that set off another whole chain of “crashing dominoes.” You’ve had too darn many dominoes come crashing down. I’m so sorry. You are doing an amazing job of getting on with your “game of life.” I’m inspired by you, as are many others, Jan. Thanks for commenting and for the nice compliment. Love this! Well done, Nancy. Like so many others, I can really identify with this. Am in the ‘relief but no euphoria’ phase just after active treatment, figuring out how to get on with living while waiting to see where the dominoes fall. Not easy, as you well know. Thanks for this! Liz, I’m sorry you identify so well. There is a lot to figure out in the ‘get on with living’ stage isn’t there? Thanks for your comment. Another great post Nancy. As always you are spot on and everything is relateable. One of your best posts! I’m going to write down my domino things. Very different from yours EXCEPT that it started with cancer. Thank you. Linda, Well, thank you. Glad you liked it. It’s an insightful writing exercise to write down your particular dominoes, so I encourage you (and others) to do it.